Using a desktop scanner to bring printed materials into Adobe Photoshop is as old as Photoshop itself. In fact, one of the reasons Photoshop became the de facto image editor is that Adobe licensed it to be bundled with scanners throughout the late 1980s and early 1990s when designers and publishers were buying their first scanners. In those days, if you bought a scanner, you got Photoshop! Now, everything has changed. After 20 years of “scanning into Photoshop,” the latest Macs, OS X, and Photoshop CS6 have made so many changes to their architecture that users of some older scanners—as well as current users of Apple's Mountain Lion (OS X 10.8) are finding it impossible to do this any longer. There are several reasons for this breakdown, and several ways to deal with the consequences. TWAIN: Beginning in the early 1990s, Apple and Photoshop supported TWAIN plug-ins. TWAIN was developed as a universal standard so that applications could access various manufacturers' scanner driver controls. In most cases, it worked brilliantly—so brilliantly that people forgot about the aging TWAIN connector technology between their apps and their scanners. Since Mac OS X 10.6, Apple has been encouraging developers to move away from TWAIN and instead use the ImageKit technology that is at the heart of Apple’s Image Capture utility. Photoshop CS6 supports both TWAIN and ImageKit drivers, but to use a TWAIN driver, you must download and install Adobe’s optional plug-in. Photoshop Elements also has a TWAIN plug-in, but you’ll have to move it from the Optional Plug-ins folder to the Plug-ins folder. Clearly, Adobe is also directing users away from TWAIN. 64-bit vs. 32-bit: In addition, Apple has been moving to a 64-bit architecture in OS X, and away from the older 32-bit architecture that almost all TWAIN drivers were written for. Adobe Creative Suite 6 offers the first version of Photoshop that runs exclusively in 64-bit mode. This means that any plug-ins you want to use in Photoshop CS6 must also be written for 64-bit operation, or they simply won’t work. Unfortunately, most TWAIN scanner drivers were written for 32-bit operation, and unless their developers chose to re-write them for 64-bit operation, you won’t be able to use them in Photoshop CS6. Drivers can be 32-bit only, 32- and 64-bit (universal), or 64-bit only, although it's very unlikely any drivers would be 64-bit only. PowerPC vs. Intel: If your scanner is really old, its TWAIN driver may have been written only for PowerPC processors and not for Intel processors. In that case it won’t work at all on Mac OS X 10.7 Lion or higher. Here’s how to tell: if your Mac is already running Lion and your scanner is working, its TWAIN driver was written for Intel processors and will work in Photoshop CS6. If your Mac is running Mac OS X 10.6 Snow Leopard or earlier, contact your scanner manufacturer and ask if your driver is Intel-native, or check the system requirements for that driver online. If you have Photoshop CS5 running in its normal 64-bit mode, and your scanner is available in the File >- Import -> … menu, then the scanner will continue to work in CS6. To be sure Photoshop CS5 is running in 64-bit mode, select the Photoshop CS5 application icon in the Finder, choose File -> Get Info, and then make sure the checkbox labeled Open in 32-bit Mode is unchecked. Conversely, if you want to scan in 32-bit mode (or use any other plug-ins that are operative only in 32-bit mode) in Photoshop CS5, you would make sure the 32-bit Mode box is checked. The bottom line is that TWAIN drivers are on their way out, and ImageKit drivers are now the standard. This scanner is wireless, so it appears as a Shared device in the ImageKit interface in Photoshop. 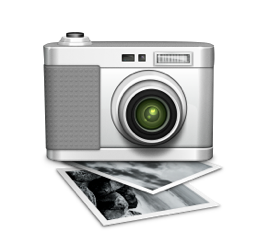 The scanner’s interface and controls here are identical to how they appear in Apple’s Image Capture utility. In Photoshop CS6, the radio buttons at the bottom give you the option of saving your scan as an entirely new Photoshop document or as a new Smart Object layer in the frontmost document—very handy! If you want to continue using an older scanner, you have several options. Check to see if there is a 64-bit TWAIN driver available from the scanner’s manufacturer. If so, install the optional TWAIN plug-in for Photoshop CS6 and your 64-bit driver. You’ll then be able to scan into Photoshop CS6. If there is no 64-bit driver for your scanner, use an older version of Photoshop, running in 32-bit mode. (To run Photoshop in 32-bit mode, select the Photoshop CS5 application icon in the Finder, choose File -> Get Info, and then tick the checkbox labeled Open in 32-bit Mode.) If necessary, dedicate a Mac for use as a scanning workstation. This solution is more common than you might think—especially with expensive scanners. If your scanner has a standalone scanning utility, use it. If not, purchase a third-party scanning utility such as VueScan from Hamrick Software ($40 for the standard edition; $80 for the professional edition) or SilverFast from LaserSoft Imaging (with prices ranging from $49 to $499 depending on the specific product). A side benefit of using one of these third-party utilities is that they often provide more capabilities than do the scanning utilities bundled with scanners, and they are often easier to use. Once your scanning utility has made the scan, save it in TIFF format and open it in Photoshop for adjustments. 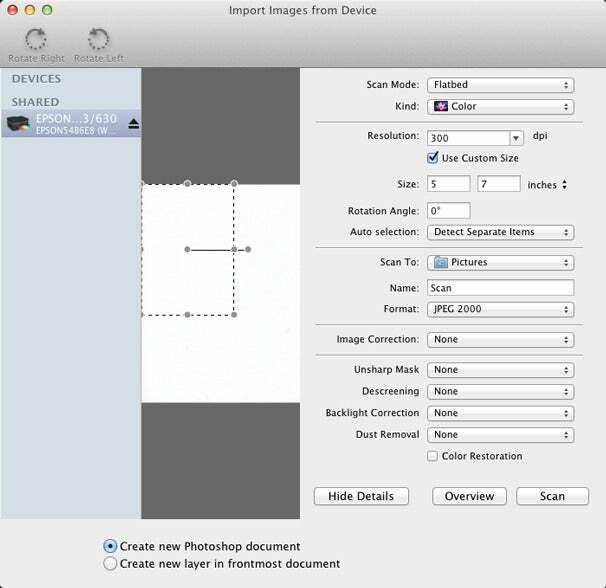 If your scanner does have an ImageKit driver, you’ll be able to access it in Photoshop by choosing File -> Import -> Images from Device. In the resulting dialog box, you’ll see your scanner and any other devices that have images on them, such as an iPhone, iPad, or digital camera. Tip: If you want to test your scanner before upgrading to Photoshop CS6, just launch Image Capture. If you can scan using Image Capture, you’ll be able to scan into Photoshop CS6. MountainLion. Right now, if users are running Mountain Lion (OS X 10.8), they will not be able to scan into Photoshop CS6 as described. According to Adobe, this is an across-the-board problem with the Cocoa classes comprising the scanning interface that it is using in Photoshop. It is neither a user nor a scanner manufacturer issue. Adobe is aware of the problem, has identified it as an Apple OS issue that they are working with Apple to solve, and offer no time frame for when it will be fixed. There are workarounds, however. Adobe suggests doing the initial scan with Image Capture in OS X and then opening the resulting file in Photoshop CS6. While using two programs instead of one is not the most elegant solution—especially if you're looking for that nifty smart object layer workflow—this technique will allow you to work with your scan Photoshop CS6.